Those up on their Star Wars trivia likely already know that Harrison Ford only won the role of Han Solo after seemingly every other viable male actor of the ’70s was considered, a roster that's been rumored to include Nick Nolte, Kurt Russell, Burt Reynolds, Jack Nicholson, Christopher Walken, Perry King, Sylvester Stallone, Robert De Niro, James Caan, and even Chevy Chase, Bill Murray, and Steve Martin (with Martin’s near-miss continuing to cause confusion to this day). Al Pacino was also famously in that mix, and at London’s recent “An Evening With Al Pacino” (just an evening? ), he discussed the many movie leads he passed on—Apocalypse Now, Pretty Woman, and even Bruce Willis’ role in Die Hard, which is somehow even harder to imagine—then offered explanation for why he turned Star Wars down. “It was mine for the taking but I didn’t understand the script,” Pacino said. 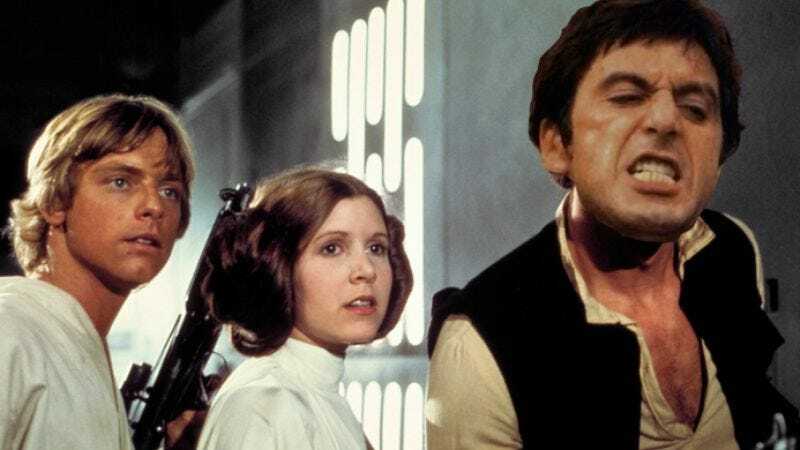 He eventually got over these sorts of hang-ups in time to star in S1m0ne and Jack And Jill, but not in time for everyone to make jokes in which they reference lines from famous Al Pacino movies, then apply them to a Star Wars context. Yes, sadly, that is a world we will never, ever know.